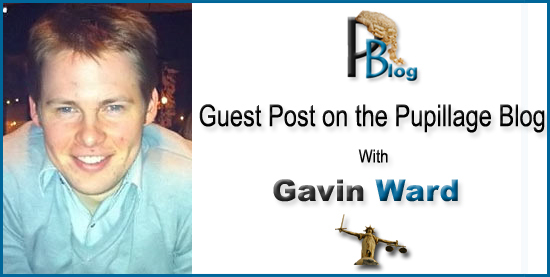 I am really pleased to welcome Gavin Ward as he pens a ‘Guest Posting’ on The Pupillage Blog entitled the ‘Top 5 Reasons for Young Lawyers and Barristers to Get Blogging’. By blogging about legal topics and commenting on other blogs, you are, immediately, engaging with the legal profession, among others. The legal profession in the UK, particularly here in Scotland, is tightly-knit and the same could be said of the legal professions of other countries around the world. A large source of the daily business of a lawyer or barrister comes from work referred to them by other lawyers. For example, for those doing court work in a remote town, a referral may come from a solicitor in a larger law firm in another location with an urgent request for an order to be sought from the Court in that remote town; for those practising technology law in a large law firm, a request may come from a law firm in a different country seeking an opinion on legal regulation of parts of their client’s business as it applies in a country with laws foreign to them; or for those practising corporate law, a referral may come from a law firm abroad representing a business looking to set up a subsidiary company. By engaging with other lawyers and demonstrating expertise in a certain area via blogging and other social media use, you are opening yourself and your firm up to potentially valuable relationships. Following on from this, if any referrals or potential referrals of business are gained from blogging activities, you will have a most justified reason for adding hours to your time sheet under business development and, indeed, when it comes to appraisal-time, you will have something else to show a contribution to the team, the practice and to your own personal development. For some, business development is just a box to check off or an additional option to fill up a time-sheet. But it doesn’t have to be a chore. And it can be very meaningful. To give an example, last year I posted a short article I had written on an international private law subject, namely issues of jurisdiction and sists of proceedings. A couple of weeks later, I got a call from a hotel owner in Glasgow, who had an action for damages in a Scottish court which had been sisted in favour of the Swiss courts. He was already a client of a large Scottish law firm and was in regular touch with two litigation partners. Nevertheless, he had, via Google, read one of my articles posted on my WardblawG website , which had held me out to be knowledgeable in that area. After around forty minutes on the phone and chatting through the general issues, I could have developed a potential business lead, although in that case I suggested he should speak with his current lawyers regarding his concerns and get in touch should he require a further expert opinion. So, by blogging, you can put a nice big tick in the business development box. I recall during my traineeship that a partner constantly called his trainees, including me, “pond life”. Pond life, he explained, was somewhere between single-cell organisms, such as amoeba, and larger creatures like fish. There was a useful Google image which helped him elaborate. This reminded me of a scene in last year’s The Apprentice where a young Stuart Baggs was told by a recruitment expert that he wasn’t “even a fish”. But it doesn’t have to be that way and you can develop your own personal brand by blogging at an early age, rather than waiting for your articles and other publications to be published. Partners in most medium to large law firms are ranked by organisations such as the Legal500 or Chambers, which have powerful directories online. They will or, at least, should have a page on their firm’s website dedicated to them, with their own email address and direct dial. They will or, at least, should write articles in legal journals, magazines or newspapers in their own name with their contact details displayed. Effectively, they have, through a long period of time, thus established a strong brand and online and offline presence. Compare that to young lawyers, barristers and, in particular, trainee solicitors. They will, most likely, have no voice on the Legal500 or Chambers website; they will, in most instances, have no page on their firm’s website dedicated to them; they will, usually, have no articles written in their own name in journals or newspapers even if they have contributed to such articles which are published in a partner’s name. Thus, if the young legal professional takes no active measures to establish a brand online via blogging or social media engagement, their potential online presence will be unharnessed. As you think, you shall become. If you think you’re pond life, you’ll become pond life. So, become the fish. Perhaps the main restriction stopping more young lawyers and barristers blogging and engaging online is a fear of damaging or destroying their reputation or a fear that the HR department of the firm and partners may frown upon time spent on work which isn’t branded and marketed by the firm. This is arguably an inherent product of the conservative nature of the profession and the choice not to blog or engage online is one to be respected if the individual or perhaps even if the firm so chooses. However, if looking to become a legal practitioner who really stands out, a strong brand, comprising strong web presence, is important if not essential. So, in order to blog or use social media effectively for this purpose, care must be taken not only to avoid destroying your reputation and future career for life. One of the best and fundamental tips for doing so is not to “belch” out all of your thoughts online, as social media employment lawyer Michael Scutt wrote recently in the Internet Newsletter for Lawyers & Law 2.0. Instead, it is important to show responsibility, self-restraint and show that you can be trusted with what are essentially powerful methods of communication. Get it right and the rewards will follow; get it wrong and repent at leisure. The law is changing constantly, in some areas more than others. And it is undoubtedly challenging to keep up, particularly if the body of law in your field is becoming larger and more intricate. Even if you do have daily email updates, read relevant legal news websites such as the Guardian’s law pages, the Scotsman’s legal section or free case law sites like CaseCheck, and stay updated on other forms of social media such as Twitter, Linkedin, or other law blogs, such as those outlined in The Time Blawg’s recent Blawg Review there’s no guarantee that the information you’ve read will stick in your mind. To improve your chance of learning and memorising new legal information, publishing on a blog can be a very useful tool. Not only does that improve your expression by forcing you to expand your own ideas, but because the information is made public, it provides a source of peer review and challenges you to get it right first time. Consider judges. Their judgments will be made available publicly in ink that will persist for hundreds of years once published. There is, therefore, little if any margin for error. Blogging is similar. Anything published on the Internet, even on Twitter, will be cached and stored in some form or other permanently. This can be a double-edged sword. On the one hand, mistakes can exist permanently and can possibly do harm to one’s reputation. But on the other hand, in addition to all the other benefits outlined above, blogging or publishing through social media can increase confidence in a certain area of law or practice, such that when you advise a client about it, you will know that you’ve got it right. For young legal professionals, these remain challenging times. Recently, a fellow Scottish solicitor posted on Twitter asking if there were any benefits which the Law Society of Scotland could deliver for its younger members, to which a senior solicitor said bluntly, “Jobs”. But even within present employment, there are ways for young lawyers to stand out. There seems to be a notion, much different from times in the 1970s or 1980s, that you need to have so many years under your belt before you become associate or partner or set up your own practice. But it doesn’t have to be that way. You only get out of your time what you put into it. One powerful way to spend your time is to network and build relationships online. By blogging or utilising social media networks such as Twitter, Linkedin or even Facebook, which are nevertheless crucial in optimising a blog’s value, you can set yourself up for success and build, and not ruin, a solid personal brand. Gavin Ward is a blawger http://www.wardblawg.com, Search and Social Media Marketing Manager at Moore Legal Technology http://www.moorelegaltechnology.co.uk/ and non-practising Scottish solicitor. He shall be speaking about the topics outlined above in greater depth at the SYLA’s annual conference on 23 June 2011. See http://www.syla.co.uk for further details. Fantastic article! I really hope that doesn’t just reach those who are already blogging! I know of individuals and small businesses that have generated a big online presence through the medium of blogging and generated business from this too.This is a great way to show off your skills and market yourself alongside some of the bigger companies or Legal500. I love blogging as it’s a chance to spread your wings beyond the necessary job description and voice your knowledge and passion for your chosen industry. If what you have to say is interesting and different from all the possible hundreds of blogs out there (yes it’s risky but if you believe in your view then stick to it and be ready to defend it) then you will generate followers who trust you and value your opinions and this will help build your presence not only online, but possibly your presence offline too. Good luck to all the young lawyers out there! Good call! And Point Three is one of the most important. As a brand, if you become known as a good blogger with plenty to add to cases and conversations, you will get noticed. And that reputation is what you want. Sadly, the ulterior is true too, but play the game right and you’ll make it!